I love cookbooks, not all of them only the ones that have fabulous pictures because those pictures invites me to cook. By looking at a picture of a dish, I can see if this is something I want to mess with, or something I want to leave alone…. A few days ago while waiting at the grocery line to pay, I picked a Cooking Light Magazine and started flipping the pages. Among the many recipes presented, one really caught my attention by its color. 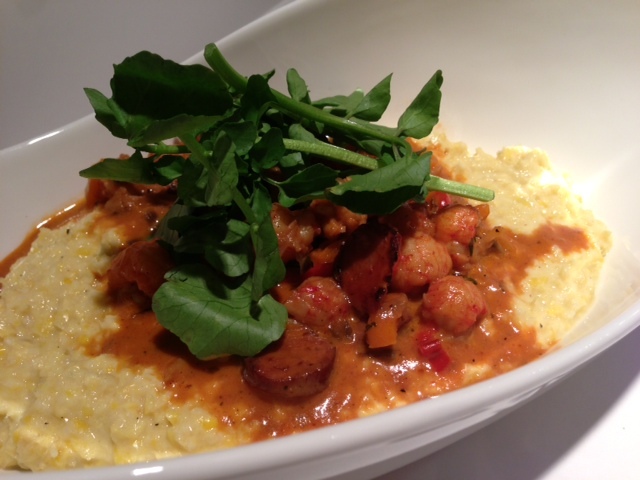 It was a recipe of Shrimps and Grits. 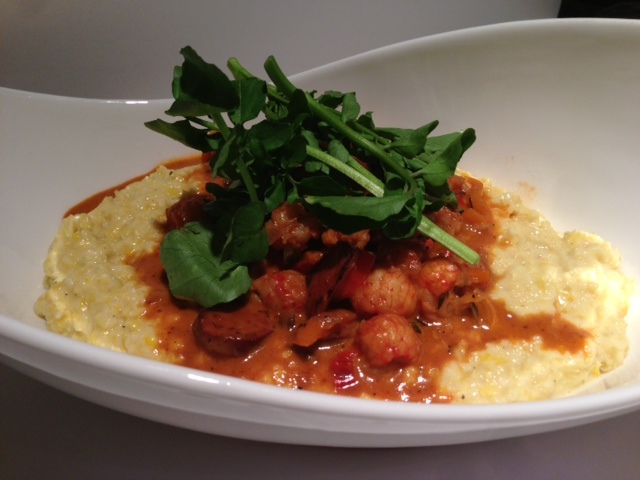 I am not usually a fan of Shrimp and grits but the picture look so delicious that I read the recipes and decided to do something similar with some lobster tails I had in my freezer. 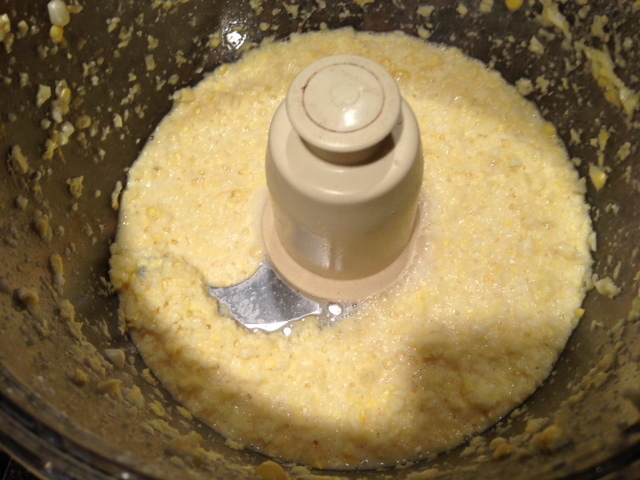 The recipe I am proposing does not follow at all what the magazine suggested as I did not buy the magazine and since I am not a fan of grits either I decided to fix a cream of corn instead of grits. 1/2 bag or about 1 lb. of lobster tail. You may use any fish, or shrimps. It does not have to be fresh, it may be frozen. If you do use frozen food, thaw it out and pat the food dry before incorporating into the sauce or you will have too much water. 2 Spicy Smoked Andouille Sausages from Johnsonville ( they come in pack of 4 or 5). 1 cup of thinly sliced bell peppers of any color but green ( I used 3 baby bell red pepper, 3 baby bell yellow pepper, and 3 baby orange baby pepper). 1/4 -1/2 cup of heavy cream ( you can substitute for 2-4 tbsp of fat-free sour cream if you wanted to make it lighter) for the sauce. In a large saute pan, warm up 1-2tbsp of olive oil and saute the onions until they are golden and start to caramelize. 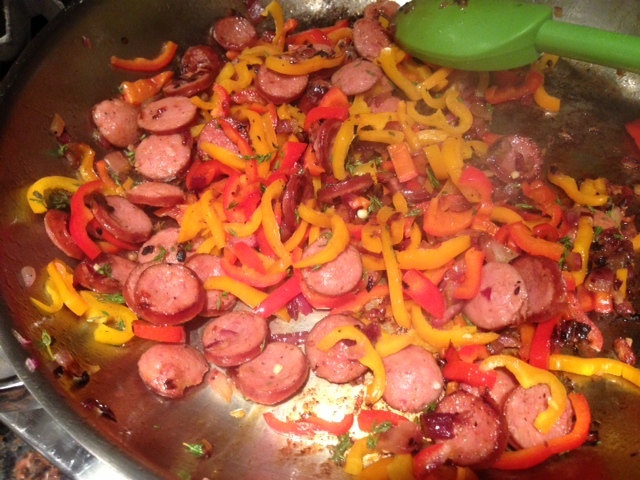 Then add sliced andouille and saute them. Finally add the bell peppers and saute them for a few minutes until they are tender. Stir in the tomato paste, the broth and the cream and bring to boil. Add a dash of cayenne pepper and maybe more if you want it more spicy. Simmer this sauce for at least 5 minutes. 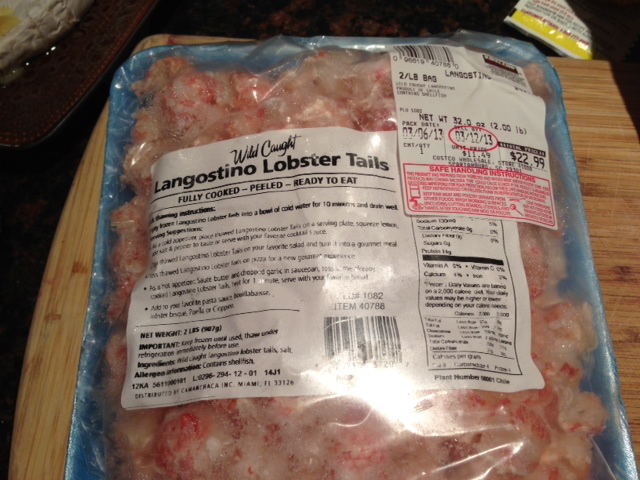 Add the fresh shrimps, cooked shrimps or lobster tails and simmer for 15 minutes. Meanwhile, prepare the cream of corn. With a sharp knife, remove the kernels off the cobb and place those into a chopper. Add 1 cup of water and chop. Empty this mixture into a medium-sized saucepan, add 1 cup of cream, 1/4 tsp of salt, 1/8 tsp of pepper and cook for a few minute on medium-low until some of the liquid evaporates and the mixture is becoming thicker. To serve, spoon the cream of corn into individual bowls. 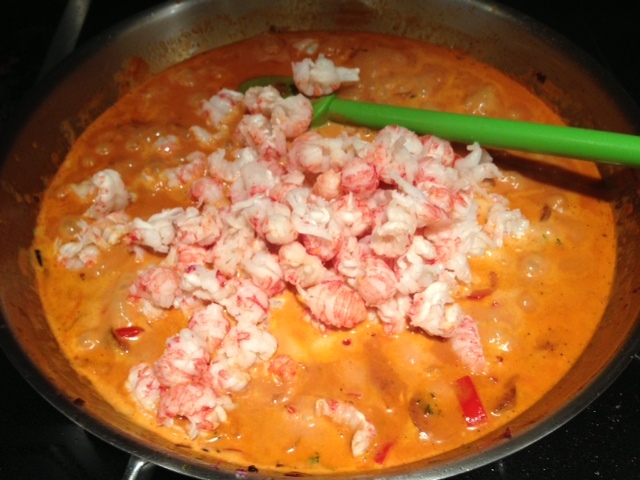 Scoop a bit of the Lobster sauce over it. For added effects, you may also add a bit of arugula. Et voila!! !